The Drager Polytron 7000 is a gas detector that can satisfy all toxic and oxygen gas measurement applications on a single platform. It is meeting the requirements of the compliance market as well as the high specification requirements of customized solutions. Drager developed the simple and structured software menu of the Polytron 7000 in collaboration with its customers. The big graphic display shows status information with the help of icons and plain text, and guides the user through calibration and configuration. The wide range of outputs, 4 to 20 mA, HART®, LON, PROFIBUS® or FOUNDATION Fieldbus™, enables the use of the Polytron 7000 on either a control system from the Drager Regard family, or third party control systems. The modular design allows for the subsequent retrofit onto any of the mentioned interfaces. With the Polytron 7000 remote sensor adaptor and lead it is possible to mount the sensor up to 30 metres from the polytron 7000 transmitter. This enables the user to read and operate the transmitter from a safe area, or detect toxic gasses and oxygen levels in difficult to reach areas, whilst still being able to view and configure the Polytron 7000 from a convenient location. A duct mount kit enables the remote sensor to be mounted direct in elevated pipe work. 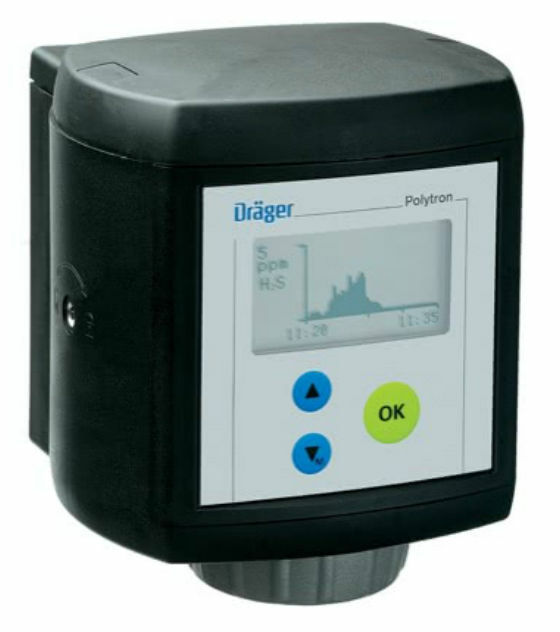 The Drager Polytron 7000 can detect over 100 different gases. DragerSensors are specifically designed for the demands of 24 hours per day, 365 days per year operation. The large DragerSensor size gives them their renowned long life. The built-in sensor data memory containing all the relevant gas and calibration information, together with on board temperature and pressure compensation gives the DragerSensor its unsurpassed measurement performance. This also allows the Polytron 7000 to accept pre-calibrated sensors, with minimal operator intervention, the Drager Polytron 7000 is a virtually maintenance free transmitter. With three different software dongles, a range of functions are incorporated into the transmitter adjusting it to user or application specific requirements.With the sensor test dongle, the Drager Polytron 7000 performs many different patented sensor tests that ensure the reliability and functionality of the sensor and gas detection system. With the new sensor diagnosis function (including the sensor test), operational demands and the remaining sensor life time is estimated so that maintenance and exchange schedules can be created. A data and event saving option is integrated into the data dongle. This saves the measured values and events such as alarms and warnings. The data can be downloaded onto a PDA m515-Ex via an IR interface and evaluated on a PC with the Drager GasVision softwareor at the push of a button, a 15 minute concentration history is shown on the transmitter display.